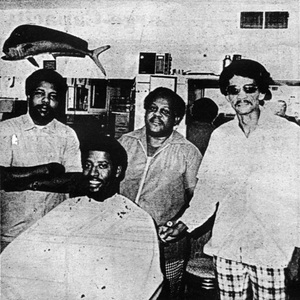 Photograph accompanying an article on the opening of Rose & Taylor's Barbershop on the site of the former Tommy's Barbershop, on North First Street. Left to right Joe Taylor. Lum Rose and new barber Danny Simms pose behind customer Hakim Muhammad. News-Gazette, “Rose and Taylors opening,” eBlack Champaign-Urbana, accessed April 23, 2019, http://eblackcu.net/portal/items/show/154.